The day Canada became a democracy cannot help but be a defining moment in our history. One hundred and sixty-nine years ago, on March 11, 1848 Louis-Hippolyte LaFontaine was summoned by the Governor General, Lord Elgin, to form a new government. Why? Because the grand coalition of Upper and Lower Canadian reformers had won a clear majority in the election of 1848. For the first time, in any part of the British Empire, it became clear that the people and not the imperial authorities would decide who was to form the government. So March 11, 1848 is one of the most important dates in Canadian history. It marks the beginning of what we might call modern Canada. Another way of putting it is that March 11 marks the beginning of Responsible Government in Canada — the now axiomatic idea that governance is properly carried out by elected citizen representatives and not colonial powers. It was a defining moment for representative democracy in Canada, marking a paradigm shift in its modes of governance, and laying the legal foundations for a society based on inclusion and egalitarianism. 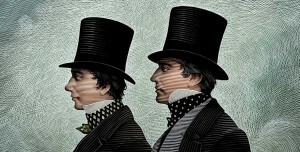 In March 1848, a Reform government – it was called The Great Ministry – led by Louis-Hippolyte LaFontaine and Robert Baldwin came into power in the United Province of Canada (the territories now known as Ontario and Quebec). During its three years in power, the Reform government laid the legal foundations for egalitarianism, nstated a system of public education, and insisted on a non-violent approach to politics. (When protesters burnt down the Parliament buildings in Montreal, the government ordered the police forces not to open fire on the crowds.) It was, as author and ICC co-founder John Ralston Saul has noted, an “astonishingly atypical” beginning for modern democracy in Canada, given the political discord in Europe and the United States at the time. Inclusion, restraint, debate, representation, egalitarianism — the precepts of good governance as we understand it today, forged by an unlikely heroic duo of Francophone Catholic and Anglophone Protestant. In 2000, John Ralston Saul founded the LaFontaine-Baldwin Lecture, an annual lecture given by a prominent public intellectual. The lecture honours the legacy of LaFontaine and Baldwin, gathering Canadians for debate and dialogue in the spirit of the public good. Past speakers have included George Erasmus, Shawn A-in-chut Atleo, His Highness the Aga Khan, Naheed Nenshi, and Robert Lepage. Last year, Naomi Klein inaugurated the ICC’s first ever 6 Degrees Citizen Space with the 14th LaFontaine-Baldwin Lecture — an urgent change for call in environmental policy. This year, as Canada marks its sesquicentennial, the principles of inclusion, good governance, and humanism are as relevant as ever. 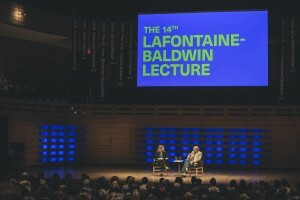 Watch Naomi Klein give the 14th LaFontaine-Baldwin Lecture here. The 15th LaFontaine-Baldwin Lecture will take place on September 25, 2017.